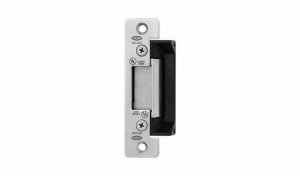 Electric Strike Unmonitored enables the electrical release of a locked mechanical latch or bolt. The Electric Strike can be configured to accommodate various types of frame styles and mechanical lock sets. Suitable for single leaf metal and wooden frame doors. Electric Strike Unmonitored enables the electrical release of a locked mechanical latch or bolt. The Electric Strike can be configured to accommodate various types of frame styles and mechanical lock sets. Suitable for single leaf metal and wooden frame doors.